Hi my favorites! I'm wearing one of my most beloved tops today. I go gaga over shoulder detail--especially puff sleeves. Pairing shoulder volume with a slim bottom is key to balancing out the proportions. You never want anything too large on bottom which will add bulk. I think skinny denim or a pencil skirt are fabulous options. I'd never have the guts to wear a shirt with puff sleeves but it looks amazing on you! dear, you have amazing smile! your photos all time so positive! nice outfit! Love the polka dot skinnies! So cute! I LOVE this shirt with the polka dot pants!! Very cute! I have to say, not many people could pull off a top like that, but you look awesome, Darby! I love it paired with the polka dot skinnies--I have a similar top and you're my outfit inspiration for tomorrow! love the polkadots!!!!! you look so cute~!!! xO! Marc Jacobs always does such great yet quirky detail. Great look; the bows and dots go well together!! So cute! I like your pants!! U are a gorgeous girl! Amazing blog u have here! Def followin u back! You look absolutely DARLING! I love the puffed sleeves, and those jeans are too cute. This is an ADORABLE outfit! I just see your beautiful personality shining through! Love the polka dot pants and the flats! You are too cute!! P.S. Thanks again for visiting/following my blog:)! I'm your newest follower! Loving the top here! Absolutely wonderful. What can I say Darby! You already know how much I love your style! !those pants are the cuttest ever. Have a beautiful day ahead and good luck and lots of joy and fun with your blog!!! You look adorable - love that top on you! looooove this!!! Those polkadot jeans are so gorgeous it's ridiculous! I've been dying for a pair! And I love the puffy sleeves on that top! So chic & adorable! Thanks for checking out my blog & following! I am most definitely following back :) Can't wait to see future posts! Thanks for the sweet comment! And, I'm loving these polka dot pants, i'll have to check out american eagle asap! I LOVE this top, the puffed sleeves are fabulous and the top goes just perfect with those jeans! So cute! I love the polka dots! You have a great blog! AMERICAN EAGLE jeans!! Lol, I have those too!! I'm so glad they have finally decided to change up their style, I bought three of their jeans this weekend when they had the whole store at 40% off!! 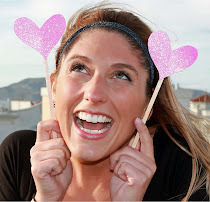 I love your blog and your happy style!! Now following too!!! We can inspire each other!! Thank you so much for visiting my blog!! I'm glad we share the same taste in clothes- I love love love those pants (sucker for polka dots) I'm following you back with pleasure!! *feel free to stop by my blog! Thanks for your comment on my blog dear! I'm now also following yours! (bloglovin). 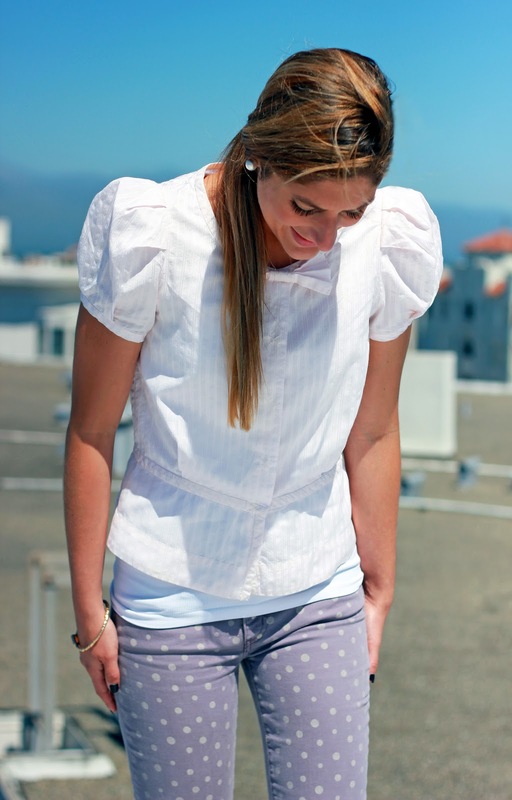 Such a cute outfit -- love those polka dotted pants! and your blog! such great looks! Wow, I like your shoes so much. Thank you for your kind words, on my blog. I'm following back via bloglovin. Oh my goodness this is too amazingly cute. LOVE those puff sleeves and have had my eyes on those skinny jeans for a while now!